Students get the message: YOU are accepted here no matter what! To download your FREE copy, click here! 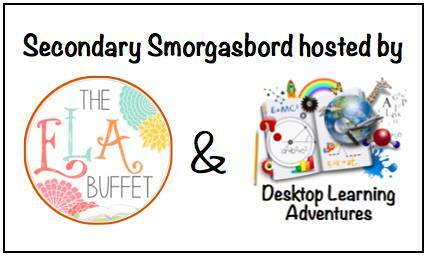 I’m teaming up with http://www.elabuffet.com/ & http://desktoplearningadventures.blogspot.com/ and many other educators as we bring you free resources this inaugural weekend celebrating compassion, kindness, acceptance, patriotism, and more! Our students are diverse, wildly varied, and unique, and we, as their teachers, accept them exactly as they are. But do our students know unequivocally that we do? How can we make it clear to them that no matter what they believe or how they look, that no matter what they have done in the past or who they hang out with, that no matter where they live or shop or worship, that we pledge to care about them as individuals as we teach them as best we can? This new and colorful Acceptance and Love poster can help make that message abundantly clear. To ensure that my students know that they are accepted unconditionally, I began working on a poster that I could prominently display outside my classroom. Anyone walking down the hallway or entering the room would see it and know that this classroom is a safe place for everyone. Over several days, I developed a list of nouns that could, perhaps, be used on the poster, and I asked friends and colleagues for their input. Mulling over each entry, I continued to revise the list, adding and deleting words and phrases until I settled on twenty that made the final cut. Against a black background, I added the vibrant flower and then pulled colors from it for the wording. I decided to mirror the colors and fonts from the top half of the list on the bottom half, symbolizing a unifying connection among all of the words. Printed, laminated, and posted outside my door, this Acceptance and Love Poster is my welcome sign–a visible, undeniable announcement that my classroom is a classroom for ALL students who come there to learn. Wouldn’t this FREE resource look great outside your classroom door as well? It is my hope that teachers, guidance counselors, principals, school resource officers, nurses, or anyone who works with young people will print out this poster and display it proudly. Let me know where you’ve posted it and what kind of reaction you receive. I’d love to hear all about it! Love the poster! Thanks so much! Students finding acceptance is key to helping them find success. Thank you for this post! What a wonderful idea! Thank you for creating and sharing it! You’re welcome, Jill! I really enjoyed creating a resource that promotes the kindness we’d all like to see in the world. Thank you so much for the generous poster with the important message! I love the poster! It’s important for students who are trying to find their way in this world to know that it’s ok to be themselves. Thank, Lisa! That’s exactly what I was hoping to accomplish. I also hope that my students will treat each other with respect and care since they know that acceptance is the expectation in my classroom. Beautiful poster! Thank you for sharing it with us.